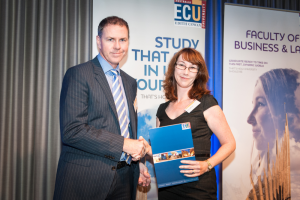 Edith Cowan University’s Faculty of Business and Law recently joined its sponsors and students to celebrate the achievements of the Faculty’s outstanding students. The annual Student Prize Evening was held on Wednesday, 25 March with over 40 donors and 62 prizes awarded. Bachelor of Law student, Tania Murray is the recipient of the Kott Gunning Legal Innovation Prize. This prize is awarded to the Bachelor of Law student whose nominated piece of work in legal writing titled Duration of Copyright in Australia, has been judged the best according to set criteria. Tania is a mature aged student that has taken advantage of ECU’s innovative Bachelor of Laws program that is delivered through a mixture of online and on-campus interaction. ECU makes use of the latest digital technologies to support the delivery of its online content and it is ECU’s progressive approach to education that inspired Tania to consider how access to copyrighted information can be best utilised in a contemporary society. The winning essay explores how the flexibility of the US fair use defence to copyright infringement has facilitated the development of innovations and new technologies in that country. It is argued Australia’s rules based approach to defences to copyright infringement and specifically the fair dealing defence, which pre-defines categories of exemption, stifles innovation and fails to future-proof the creative endeavours of Australians. Tania thanks Kott Gunning for its investment in this student prize and its recognition and support of innovation in the community. Edith Cowan University’s School of Law and Justice has been offering established and accredited law courses for over a decade. Its courses are developed in consultation with industry to help students achieve their aspirations of a challenging and rewarding career in law and to equip them with the skills that employers seek. Its many hands-on learning opportunities include participation in international mooting competitions, in ECU’s Criminal Justice Review Project (which reviews cases of wrongful conviction) and the opportunity the opportunity to work with real cases, under the supervision of legal practitioners, at the on-campus Northern Suburbs Community Legal Centre. Kott Gunning encourages the pursuit of academic excellence and supports prizes and awards to recognise individual achievements at most Western Australian law faculties. Litigation partner Mark Fatharly represented Kott Gunning at the Student Prize Evening.